One of my favorite things about having twins is how much they love each other. The older they get the more they interact and play together (and fight, but we'll leave that for a different post). It's incredibly sweet (the playing, not the fighting!) 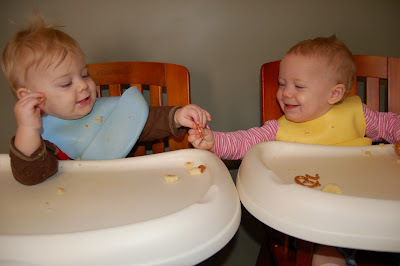 They especially love sharing while they are in their high chairs. And while we're on the topic, we've been prepping Lila for her transition into Sunbeams. We were telling her about primary and music time trying to get her excited. When we told her about sharing time she got a sad look on her face and said, "I don't like sharing." P.S. I just thought you'd like to know that yesterday at noon it was EIGHT degrees outside at my house. It has been so fun to catch up on all of your cute stuff! You guys are so cute! I'll hopefully see you either in Utah in the summer or we might pass through on our way to see Greg's parents in Canada! You need to come and visit North Carolina. Yesterday at noon it was about 68 outside our house. Today it's just 60.